Today I continue my theme from yesterday which focused on how retired politicians and bureaucrats in the US are massing using resources from rich conservative interests to undermine the capacity of the US government to fulfill its legitimate responsibility to increase employment and raise living standards. In today’s blog I reflect on an excellent US PBS Frontline program which looks back at the days when the neo-liberals led by Alan Greenspan and his gang were ruling the world. The current crisis that has undermined the employment and income prospects for millions around the world is directly attributable to their ideological zealotry. The unfortunate thing is that the gang members are either still in power or reinventing themselves as credible commentators. It doesn’t augur well. 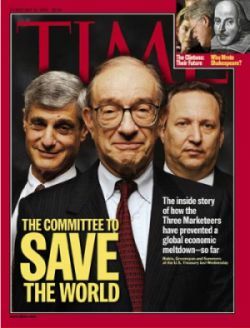 On February 15, 1999, Time Magazine carried this front cover extolling the virtues of the Committee that Saved the World – Robert Rubin (then US Treasury Secretary), Alan Greenspan (then Federal Reserve Chairman) and Lawrence Summers (then Deputy US Treasury Secretary). Summers took over from Rubin in 1999. Events have caught up on the “Committee”. In October 2008, Greenspan admitted to a US Congressional Committee that his ideological world was shattered by the crisis. Greenspan’s ideological connection with Ayn Rand and her extremist views is seen by reasonable people (such as myself) as being a key component of the financial anarchy during his reign as Federal Reserve Chairman which finally manifested in the collapse of the world financial system and the ensuing rise in unemployment and income losses. His dirty hands are well and truly all over the collapse. Finally, Lawrence Summers continues to humiliate himself and damage his fellow citizens via his inability to design policy that will advance public purpose. Instead he consistently champions policies that hand over billions of public money to the rich guys on Wall Street. I recalled the Time article (which covered the Russian and Latin American debt crisis) as I watched the US PBS Frontline program The Warning which went to air in the US on October 20, 2009. It is available via the Internet now and is worth viewing if you have the time. It documents that struggles that Brooksley Born, who became the head of the US federal Commodity Futures Trading Commission had with the Committee that Saved the World. I especially liked the segment which described Born’s first lunch with Greenspan after she was appointed as Head of the Commodity Futures Trading Commission. Apparently, Greenspan expressed a “disdain for regulation” and when she raised the issue of the problem of financial fraud Greenspan said that “the market would take care of the fraudsters by self-regulating itself”. So never mind the real damage caused to people’s life savings or life-time employment entitlements (pensions etc) or jobs – the market will see to it that a monumental failure driven by fraud (for example, Enron) is sorted out. And … meanwhile … very few of the fraudsters ever really get rounded up and punished. Born had wanted to regulate the growing and secretive Over the Counter (OTC) derivatives market and met with great resistance from Rubin, Greenspan and Summers. She told the program that “Alan Greenspan at one point in the late ’90s said that the most important development in the financial markets in the ’90s was the development of over-the-counter derivatives”. This New York Times article from last year – Taking Hard New Look at a Greenspan Legacy provides a good summary of the events. It documents the fierce opposition that Greenspan, Rubin and Summers put up against any notion of regulation of the financial markets. He now cannot recall that conversation or ever making the statement. On October 23, 2008, Greenspan appeared before a US Congressional Committee of Government Oversight and Reform hearing. His Testimony – all 1133 words – was somewhat remarkable given that previously he had been the king-pin when he had appeared before this Committee. The consequent surge in global demand for U.S. subprime securities by banks, hedge, and pension funds supported by unrealistically positive rating designations by credit agencies was, in my judgement, the core of the problem. Demand became so aggressive that too many securitizers and lenders believed they were able to create and sell mortgage backed securities so quickly that they never put their shareholders’ capital at risk and hence did not have the incentive to evaluate the credit quality of what they were selling. But it was the grilling he received from the Committee that was most telling (see full transcript. “We do not believe a publíc policy case exists to justify this government intervention (made after Enron collapsed in 2002). “Bank loan officers, in my experience, know far more about the risks and workings of their counterparties than do bank regulators” (made in early 2008 just before the collapse). So the problem here is something which looked to be a very solid edifice, and, indeed, a critical pillar to market competition and free markets, did break down. And I think that, as I said, shocked me. I still do not fully understand why it happened and, obviously, to the extent that I figure out where it happened and why, I will change my views. If the facts change, I will change. The question I had for you is you had an ideology. You had a belief that free, competitive – and this is shown – your statement, “I do have an ideology. My judgment is that free, competitive markets are by far the unrivaled way to organize economies. We have tried regulation, none meaningfully worked.” That was your quote. You have the authority to prevent irresponsible lending practices that led to the subprime mortgage crisis. You had the authority to prevent irresponsible lending practices that led to the subprime mortgage crisis. You were advised to do so by many others … Do you feel that your ideology pushed you to make decisions that you wish you had not made? Well, remember, though, whether or not ideology is, is a conceptual framework with the way people deal with reality. Everyone has one. You have to. To exist, you need an ideology The question is, whether it exists is accurate or not. What I am saying to you is, yes, I found a flaw, I don’t know how significant or permanent it is, but I have been very distressed by that fact … I found a flaw in the model that I perceived is the critical functioning structure that defines how the world works, so to speak. After acknowledging that disgrace – considering the millions of Americans who are without work now and heading south into poverty, not to mention the millions of workers around the world that have lost their jobs and savings and more – any reasonable person would avoid the public limelight. But not Greenspan. He is larger than life still and making regular appearances in the media and in official government inquiries. This tells me that the neo-liberals are basically not shamed by their actions. They laid low for a while – a few made some concessions (such as Greenspan above) – but now they are coming out of the slime again larger than ever. It is commonplace for a Night of the long knives to follow the overthrow of a particular government by the opposition. Although the expression historically refers to the unsavoury and criminal way the Nazis purged their opponents in the early 1930 to pave the way for Hitler to concentrate his power base, it is also used more generally. In the more general sense, it refers to a newly elected government sacking all the “political” appointments in the senior bureaucracy and then running a subtle campaign to disgrace them. The problem in the US at present is that the Obama transition just continued the Wall Street influence in top levels of government. So those who should be hanging their heads in shame are still on the payroll designing and implementing policy. Anyway, after being disgraced last October before the Congressional hearing, Greenspan still thinks he has something to say that we want to hear. Last Sunday (December 13, 2009) Greenspan appeared on the US NBC Meet the Press program program – Netcast – Transcript. The presenter is David Gregory and the focus was the economy. MR. GREGORY: Let me turn to another question about the role of government, and that is the role of the Federal Reserve. Dr. Greenspan, Paul Krugman, liberal economic economist for The New York Times columnist, wrote this this week about what the Fed ought to do …. Does the Fed have more to do? … The difficulty is there is a limit. And if the Federal Reserve does not, in fact, pull in all of the stimulus it’s put into the economy, then down the road is inflation. It’s a long way down the road and it’s not immediate. But the question is, you cannot ask a, a central bank to do more than it is capable of doing without very dire consequences. I have discussed why Paul Krugman’s continued claims that quantitative easing will provide banks with more capacity to lend is false in this blog – Building bank reserves will not expand credit. Krugman reveals a failure to understand how the monetary system actually operates. But Greenspan also reveals the same ignorance in his statement above. He also further thinks that the reserves constitute a stimulus to demand and will be inflationary “unless they pulled in”. I cover that errant proposition in the second part of my billogy – Building bank reserves is not inflationary. So in this single statement that quantitative easing is inflationary you realise that Greenspan – ideology aside – doesn’t understand the way the monetary system actually operates. I had an interesting conversation a few weeks ago with a highly ranked banker who repeated the often-heard statement that Larry Summers is a really bright guy. So he said that calling these guys stupid is not an option. The same sort of claim is made of Greenspan. However, if you read their books and articles and analyse their public statements then consider that they are talking about a modern monetary system – it is easy to conclude they are either stupid (that is, do not understand the operations of the system) or, alternatively, they are aiming to deliberately mislead the public (to advance their ideological agenda). It is a fair bet to say they are not stupid. So they must just be ideological warriors prepared to distort public perception. After all, the extremist Ayn Rand was the intellectual light for Greenspan. I am opposed to all forms of control. I am for an absolute laissez fair free unregulated economy. Let me put it briefly I am for the separation of state and economics. Ayn Rand became a stabilising force in my life … It hadn’t take long for us to have a meeting of the minds mostly my mind meeting hers. Little bit curious for a central banker, because what is central banking? It’s a massive intervention in the market, setting interest rates. So to me, that kind of perspective, to say, “I believe in free markets, but I’m going to accept the job at central banking,” is a contradiction. You almost have to be schizophrenic. Greenspan most recently appeared before a current Senate Committee on Homeland Security and Governmental Affairs hearing. You have to give it to the Americans – they are a nation apart. The title of the Senate Committee hearing is Safeguarding the American Dream: Prospects for Our Economic Future and Proposals to Secure It. Only the Americans would come up with that sort of title. Well the American Dream has been trashed well and truly by a sequence of very poor governments and their economic advisors who systematically demonstrate by the policies that they advocate that they do not work for public purpose. For more than two centuries, we have been able to hold the level of U.S. federal debt to well below our long-term capacity to borrow. But for the next decade or two, on some reasonable sets of assumptions, our borrowing cushion shrinks significantly, threatening to test our capacity to raise funds to finance unprecedented deficits. Only if the Congress blocks bills to raise the limit or (preferably) the US Government abandons the law that requires it to borrow to net spend. I also like the use of the phrase “some reasonable sets of assumptions” – which was also underpinning the Pew-Peterson Report I examined yesterday. When you actually get down to analyse the reasonableness of the assumptions you find they usually have some extreme assumptions and some wrong-headed reasoning. Greenspan certainly does not spell out his forecasting environment. He continued to talk about the future challenges and homed in on the US Medicare and Medicaid system. He said that in these areas “in-kind entitlements” are determined by “individuals’ particular medical needs”. Yes we can agree on that. Short of some form of market price or administrative rationing (a political third rail), ever rising medical services will eventually strain the physical capacity of our economy … The simple fact is that we have promised resources which by any reasonable projection we will not have – a morally untenable position. Those who will retire in the years ahead depend on government’s promises to plan their future. We are not dealing with a simple problem of finance, solved with the addition of appropriated dollars. It is a physical resource crisis. If the dollar share of GDP devoted to medical services is rising, so is the share of medical workers in our labor force and medical hardware in our capital stock. Importantly, a dollar of the nation’s scarce saving employed to finance a new medical technology investment is a dollar not available to fund other critical non-medical cutting-edge technologies that enhance our material wellbeing. So this is interesting. He is largely talking about the physical availability of real resources. It is not a public finance problem. If there are real resources available in the future to be put to work in the health care industry then the national government will be able to purchase them at any time such availability is present. The nuanced “we are not dealing with a simple problem of finance” should have read – the intergenerational health issue is not a problem of the inacapacity of the national government to spend. It is clear that if resources are fully utilised then choices have to be made on appropriate use. These choices will be political in nature. The national government will always be able to afford the spending choices dictated by the political mandate it receives. The recommendation of Senators Conrad and Gregg for a bipartisan Fiscal taskforce is an excellent idea. I trust any such taskforce will address the very thorny issue of the asymmetrical consequences of too much or too little fiscal restraint. In the former case, too much restraint is not a risk, and would, in any event, free resources for other initiatives. The dire consequences of a failure to tighten sufficiently to balance our books, however, calls for policies that err significantly on the side of restraint. I understand that this is politically very difficult to do. But our nation has never before had to confront so formidable a fiscal crisis as is now visible just over the horizon. It is really hard to map this ridiculous statement back into the main theme he was developing. It was almost as if he really wanted to get the budget hysteria going but strayed for a little while on other issues. It is clear that reinvention and historical revisionism is the order of the day. More and more of these neo-liberal zealots are speaking out again – after being initially shamed and silent. The irony is that fiscal policy has reduced the damages their actions (or inaction) caused yet they are doing their best to undermine it. Given their links to the top-end-of-town which has clearly profited massively from the public handouts, it is no surprise that they want to stop the fiscal expansion in its tracks for fear that some of the largesse might be spread a little further to the unemployed. It is a pity the ordinary Americans couldn’t see it within their powers to redux their revolution when they threw the British (and French and Spanish) out. This time their targets should be Wall Street and all its connections in the political sphere. Which means that the Saturday quiz will be back … this time with steel teeth! One of your recurring themes Bill, not stated explicitly, seems to be that the American neo-liberals are more interested in defending “concepts” rather than people. Their concept of money as something that should have a value that is defended, their concept of inflation as a boogey man around the corner and their concept of government debt as equal in nature to private debt are three of the most obvious examples. I really wonder if there is any hope of ever altering their conceptions of these things? That seems to be at the core of the schism. You have correctly termed this thinking as religious in nature and religious people do not easily become “atheistic”. Unbelievable how they refuse to understand anything. Great post as usual, Bill. I unearthed an interesting factoid: the recently deceased Paul Samuelson was Larry Summers’ uncle (father’s side). And apparently, Kenneth Arrow is his uncle on his mother’s side. Probably well known to most Billyblog readers, but it was news to me.